Twinkle | Oh, Twinkle. Twinkle – Oh, Twinkle. The Domestic Man posted a wonderful recipe for Blaukraut (German Red Cabbage) last week and after all of that “beige” holiday food, I am ready to add color back into my life in the form of antioxidant-rich cabbage. This is an excellent foolproof and economical recipe that doesn’t require any special produce or pantry ingredients with the possible exception of cloves. The resulting recipe is a wonderful homey side dish that pairs very well with pork and wintery root mash of parsnips & cauliflower; if you can have white potatoes with no issue (some Paleo folks do indulge), I recommend using that in the root mash instead of cauliflower. I will admit: I am not infallible. While I am able to navigate through most non-Paleo items without temptation, I do go weak over sour gummy candies or gelatin snacks. Thankfully, this is not something I contend with at home but the office is another story. They recently stocked up on some “healthy” fruit leather snacks (chock-a-block with corn syrup and canola oil) so to keep my cravings at bay, I plan to make a big batch of Balanced Bites’ sweet & sour gummy gelatin snacks to keep in the office refrigerator. These treats are an excellent way to get plenty of gut-healing and joint-soothing goodness by way of grassfed gelatin. I use the Great Lakes kosher gelatin (in the red canister) and I do lean towards the sour end of the recipe by swapping the 1/4 cup water for more lemon juice). I’ve successfully made “berry” versions of these gummies and now that they are out of season, I will test the quality of frozen berries and report back. These gummies do require a bit of trial and error to suit your palate (taste and texture-wise) but no matter how you tweak it, the end result is still delicious! Thanksgiving is thankfully in our rearview mirror so now I can post some recipe reviews! This holiday, I tried two recipes from Nom Nom Paleo: Cran-Cherry Sauce and Roasted Brussels Sprouts with Bacon. Cranberry sauce never made it to my family’s Thanksgiving table but with the new extended family, I thought I ought to try my hand at this Thanksgiving classic. Michelle’s version omits the copious amounts of refined sugar and balances the tartness of cranberries with apple juice and cherries. I used fresh cranberries and ginger, frozen organic cherries, and organic unfiltered apple juice. Definitely use fresh ginger; the grated root adds a much-needed spicy note to this sweet-tart sauce and I found that I did not need to add honey for additional sweetness. I also added some grass-fed gelatin (a conservative 1/4 teaspoon) but unfortunately, I did not use enough to achieve the classic canned shape. Next time, I will add 1/2 teaspoon so the sauce will have more of a jelly-like consistency. For the brussels sprouts recipe, I doubled the amount as I was cooking for twelve people. My oven runs hot so I reduced the temperature from 400 to 385 degrees Fahrenheit. I used olive oil as I ran out of ghee and splashed a little extra golden balsamic vinegar on the uncooked sprouts. Golden balsamic vinegar is lighter in color and tastes slightly sweeter than the regular dark brown balsamic; the golden vinegar also does not darken food so it is a good choice if you are concerned with presentation. I thought the sweeter flavor would be a nice contrast to the earthy sprouts and copious bacon. The sprouts & bacon came out perfectly right at 35 minutes and I drizzled some extra balsamic vinegar on the cooked sprouts. These were a hit on the Thanksgiving table and even managed to convert a few diehard haters into newly minted fans of the tiny cruciferous vegetables. This is a foolproof side dish that works great for everyday and special occasion holiday meals so definitely add this one to your recipes folder. Did you try any new recipes for the Thanksgiving holiday? I’d love to hear your recommendations! Stupid Easy Paleo knocks the leftover game right out of the park with her recipe for a Paleo Thanksgiving leftovers sandwich. This delectable sandwich combines turkey with brussels sprouts, drizzled with cranberry sauce, and is sandwiched between two sweet potato latke-style buns. You can definitely tweak this recipe based around your leftovers: gravy instead of cranberry sauce; mashed potato or even stuffing pancakes instead of the grated latkes; the variations could go on forever. If you prefer some lighter fare after the Thanksgiving indulgence, Martha Stewart offers a restorative turkey broth with chiles and tomatoes. This light soup uses the roasted turkey carcass to create a rich broth; the recipe as posted does not actually call for turkey meat but you could easily add it in to make a more substantial meal. Definitely do not skip the lime as the acidity brightens the flavors of the soup; you can serve it with additional wedges on the side. Homemade Bone Broth – Ideally, this is something everyone should have in their freezer at the ready but sometimes life gets in the way of things and you are left empty-handed when you need it most. During those times, I make a “cheat” broth using a pre-made organic free-range chicken stock (I like Pacific Foods Simply Stock) and I add a tablespoon of grass-fed unflavored gelatin. Why the gelatin? It adds in those vital healing nutrients and minerals that are normally found in homemade bone broth. Water – Hydration is essential for all of our organs to function properly so it is doubly important to drink adequate amounts of water when sick. You can boost the trace mineral content by adding a 1/4 teaspoon of genuine sea salt to your first glass of water for the day (I use HimalaSalt); do not use regular iodized table salt. Herbal Teas – If I have the time and ingredients available, I like to make Golden Elixir which is a variation of golden tea used by those who practice kundalini yoga. Turmeric is a potent anti-inflammatory spice that can help a wide variety of health conditions and not just cold & flu. If you have access to fresh turmeric, I recommend it as I find it tastes nicer than the dried powdered root; I am also extra generous with the cayenne and lemon but I love spicy and sour flavors (sick or not). When I am on the go and need a convenient pre-made tea, I use Celestial Seasonings Echinacea Complete Care Tea. It is caffeine free so those with caffeine sensitivity can use it any time of the day without fear; however, it looks like CS may now only offer it in combination with their Sleepytime Tea formula so use with caution during waking hours. Oil of Oregano – From a purely anecdotal standpoint, I have had great success with Oil of Oregano as an antibiotic (both internal and external use). As always, your mileage may vary but this supplement has a permanent place in my medicine cabinet. It is the only antibiotic that does not disrupt my digestive health and I have used it in place of prescribed antibiotics for this very reason. I like the Gaia Herbs brand as the oil comes in an easy-to-swallow capsule form; it is also packaged in a dark glass bottle to prevent rancidity. If I need it for topical (external) use, I simply puncture a capsule and apply where needed. Diane goes on to provide many other great recommendations so please check out the whole top 10 list. If you have any Paleo-friendly cold & flu remedies, I hope you will share your comments. Growing up, my parents prepared meals in a way that made meat a (delicious) supporting character rather than a leading star in our family meals. One of the star players for many of those childhood meals was the humble inexpensive egg. Yes, there were plenty of scrambles and sunny-side-up eggs but seldom did we see those for breakfast. Eggs appeared in many luscious braises, ethereal seafood-tomato noodle soups, and even a unique quiche-meatloaf hybrid; those sunny-side up eggs topped everything from sandwiches to rice bowls. Alas, my mom eventually fell prey to the nutrition info of the times which vilified the egg as a cholesterol bomb, and our household egg intake dropped dramatically. Fast forward to present: while eggs have not completely shed their villainous past with the general public, new research emerges that may help change the negative image of eggs. It’s a slow process undoing of years of widespread misinformation and Paul Jaminet of the Perfect Health Diet blog tackled an assertion that egg consumption is directly correlated with colon cancer, a charge leveled by an ardently vegan reader based on a study that used data collected by the World Health Organization and Food and Agriculture Organization of the United Nations. Paul masterfully dissected the study and presented many helpful graphs based on the exact same data to show how the study was flawed. He even went on to state that the data used in the study indicated that egg consumption may even extend lifespan by reducing cardiovascular disease mortality. Egg-cellent news for fans of the egg! All of this new research thankfully reinforces my choice of eggs as my primary Paleo/Primal protein source. With animal protein making up a large part of the Paleo/Primal diet, it stands to reason that this lifestyle could easily eat up a large chunk of your wallet. Pastured meats, while more affordable than in years past due to increasing demand, remain out of reach for most households (present company included). Eggs are relatively inexpensive, even when purchasing from an organic soy-free, true pastured source (my favorite being Coyote Creek Farm’s Jeremiah Cunningham’s World’s Best Eggs). They are also nutrient-dense and easy to find at any grocery store or farmers market. I buy more eggs than any other animal protein sources as they are an incredibly versatile culinary ingredient. My meat-minimal upbringing definitely made an eggs-centric focus easier when I transitioned into the Paleo lifestyle. How can you get more of this healthy food in your life? 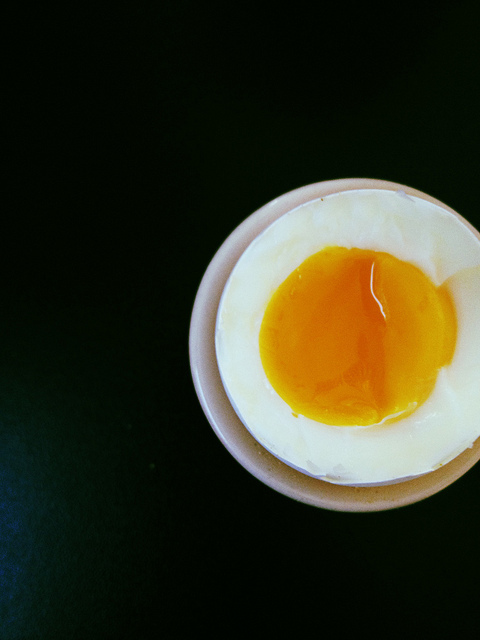 If you have a cooked egg aversion, you can always start with an easy Paleo mayo. A good beginner recipe is the popular Paleo mini frittata “muffins”. And if you’re ready to break away from the “eggs as breakfast” concept, why not try the exotic-sounding Ijjit Qarnabit (Lebanese Cauliflower Omelet), served with a side of tabbouleh salad (subbing hemp seeds for the bulgur wheat) for lunch or dinner?